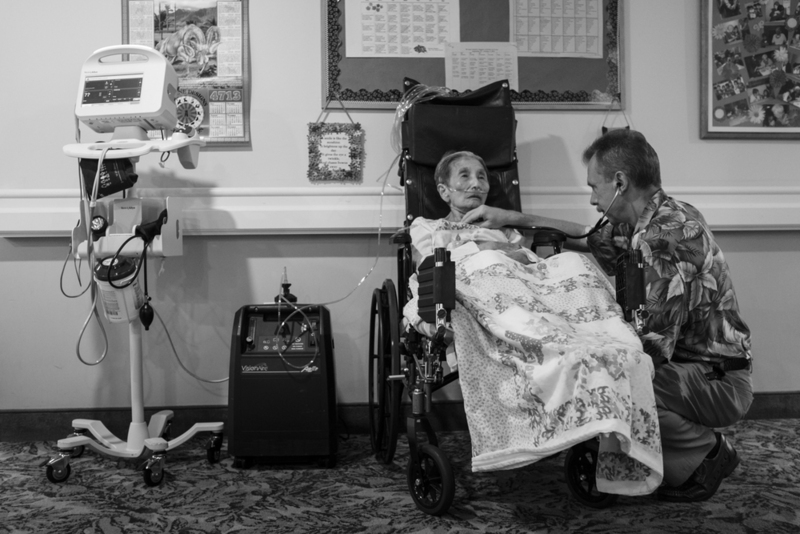 On September 29, 2015, I visited popo in her room at Kahala Nui's Hi'olani Care Center. She was mostly unresponsive and unable to speak. Every once in a while she would open her eyes to look in my direction. Struggling to speak, she'd let out a long sigh and would return to sleep next to a Minnie Mouse doll that my niece, Emma Yamada, gave to her as a gift. Dr. Alex listens to popo's breathing and monitors her oxygen level to make sure she's comfortable. 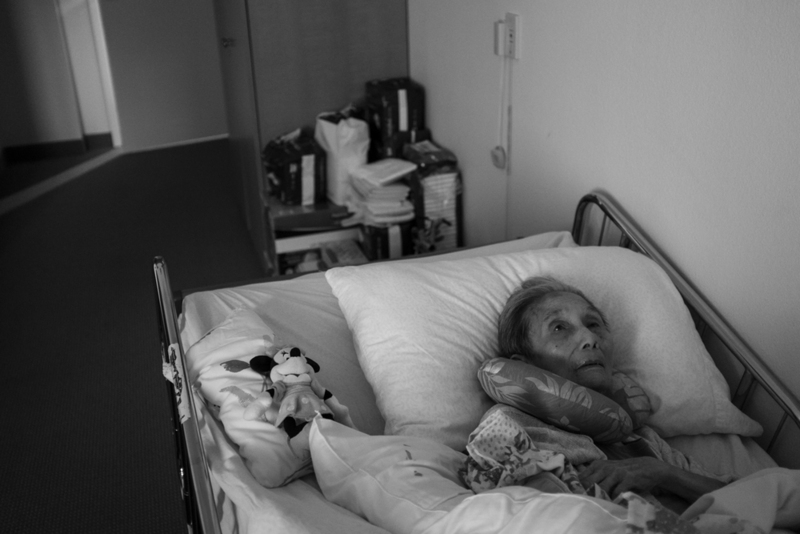 Popo sits in a wheelchair outside of her room so the attending nurses can look after her during lunch time. My mother, Kathy Hida, tries to feed my popo some juice to keep her hydrated. A few days before popo passed away, she stopped eating and drinking altogether. 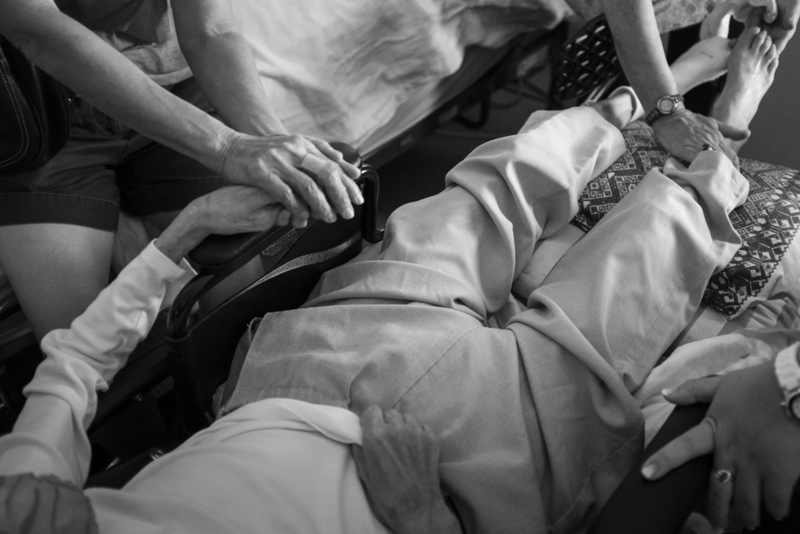 As my mom held popo's hand, nurses slipped on thicker socks onto her feet to keep her warm. Over the past month my grandma had lost 10 pounds as she progressively stopped eating and drinking. My mom slips a thick mitten onto popo's left hand. Popo constantly scratched herself in her sleep, which would lead to bad sores on her body. The mittens helped to prevent these self-inflicted wounds. Popo hated these gloves and was clever enough to tuck her thumb in her palm to make the task of slipping on the gloves challenging for the nurses. 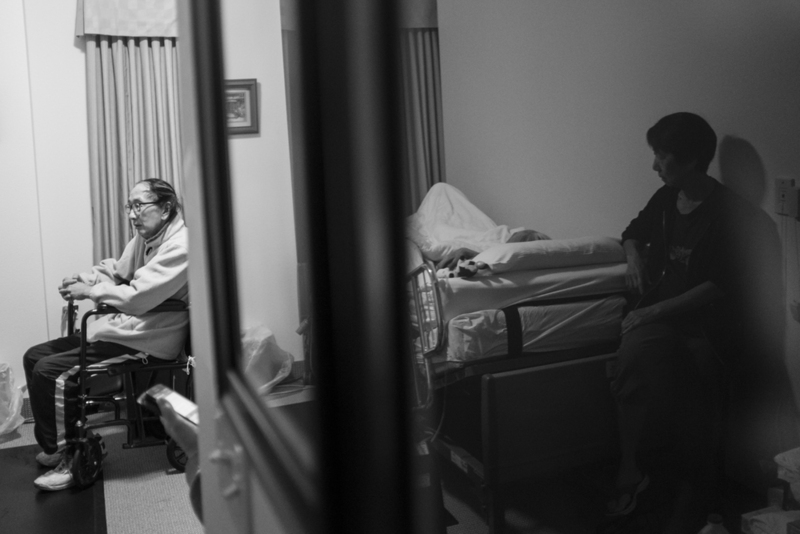 A nurse lifts popo from the wheelchair to the bed so she could get some rest. Popo quickly became exhausted after exerting a lot of energy from all the excitement of visiting family. 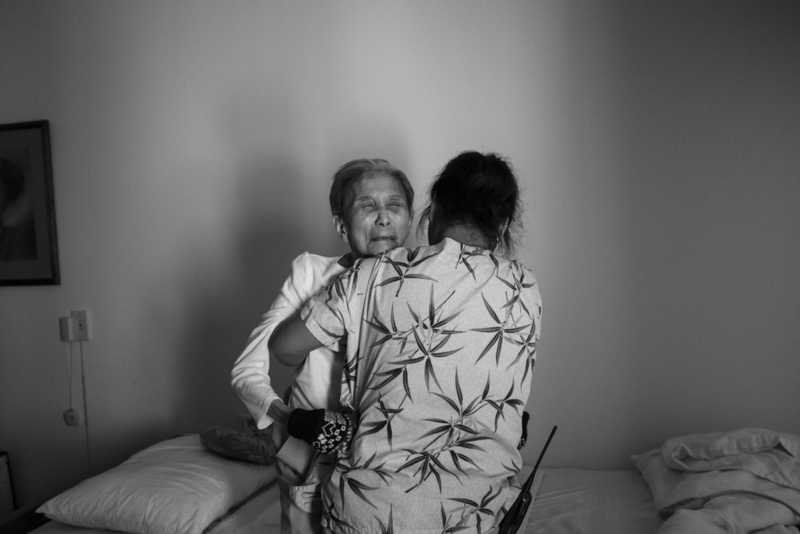 After we watched popo pass away, a nurse came in to verify her death by checking her vital signs. My uncle Peter and aunty Penny stood close by. My uncle Peter and aunty Penny arrived on October 1, 2015 from Toronto, Canada. 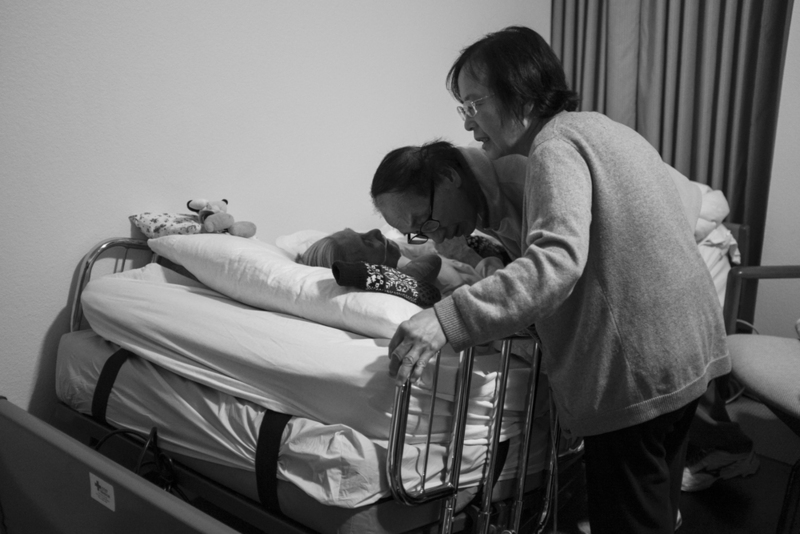 Peter bends down to listen to his mom whisper to him from her bed. 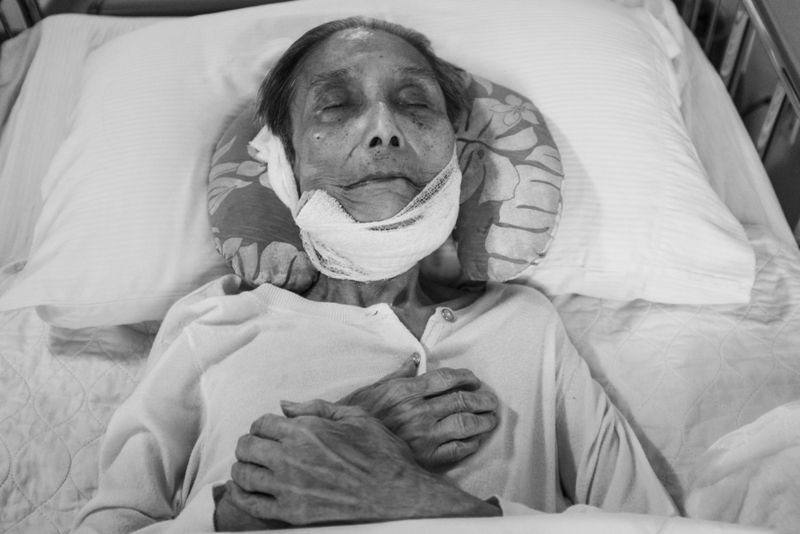 On October 3, 2015, popo passed away peacefully in her sleep. As her breathing slowed my uncle Peter and aunty Penny reached out to touch her forehead and chin. As popo laid peacefully in her bed, my mom and my uncle Peter waited for a couple hours for the mortuary to pick up her body. My mom and my aunty Penny discuss which dress my popo should be wearing when she is cremated. Ultimately, we decided on the light yellow dress in the center. 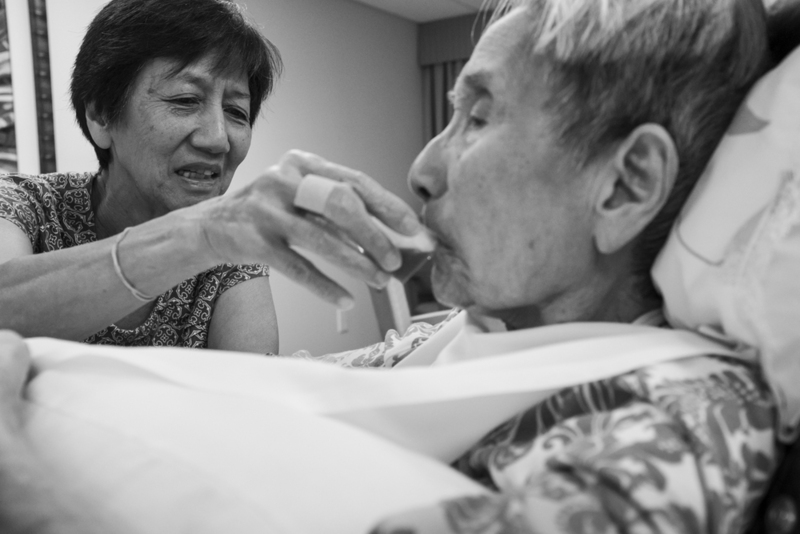 The nurses performed afterlife preparations and wrapped a gauze around popo's jaw. Popo laid peacefully with her arms crossed. 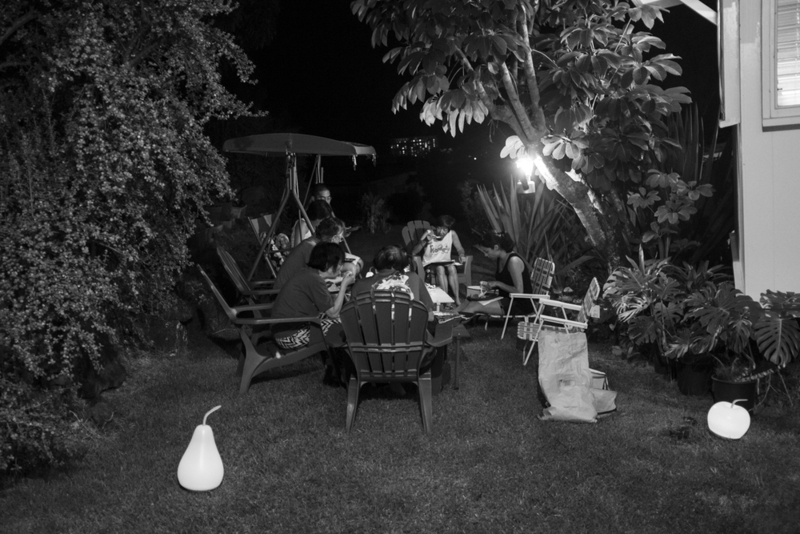 The evening after popo passed away, our family sits together in my parents' backyard. We cooked too much food and enjoyed each others' company as my popo would have wanted. We toasted to her passing and celebrated our lives together. As dinner winds down, my mom holds her granddaughter, Emma, gazing up at the stars twinkling in the sky. 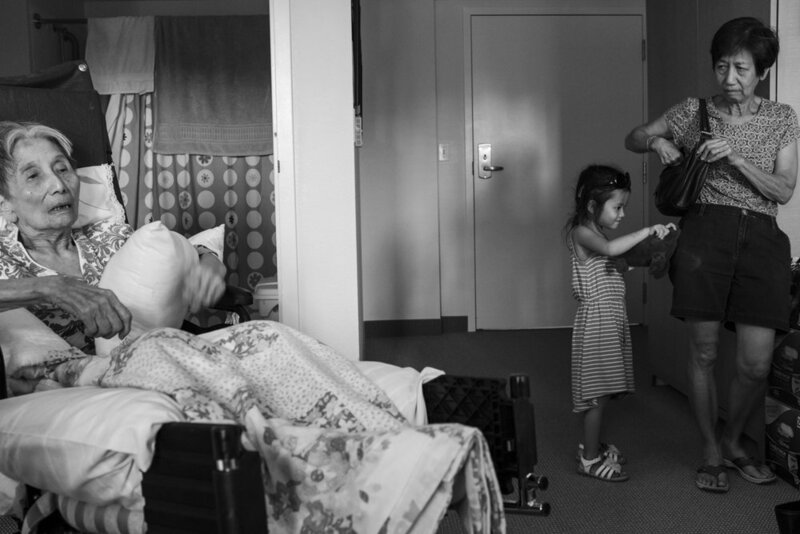 Emmalyn Yamada, 4, takes ballet and jazz dancing classes every weekend. Before we put away the table and fold up the chairs, my mom and her granddaughter dance together around the backyard practicing her routine. Every year when school let out, Yukiko and I spent the summers with our popo and goon goon in their condominium in Kaimuki. Perched up on the seventh floor we looked down on a dried up stream bed lined with monkey pod trees, and filled with shopping carts and scattered trash. The opaque curtains and Vornado fan provided little relief from the heat as the afternoon sun blazed through their living room windows. When the little pink ribbon stapled to the grill of the fan fluttered uncontrollably, it meant it was time for my sister and I to head to the pool. I found goon goon's keychain buried in a junk drawer in my popo's room. It looks exactly how I remember: The key ring is worn at the closure and the silver rubbed off to reveal brass. Every Christmas both sides of our family gather at my popo and goon goon's house to celebrate. Following dinner we pull apart poppers to reveal tiny trinkets and a paper crown. In 2008, we celebrated Christmas with a game of bingo (from left to right: my grandpa, Sueo Hida; my grandma, Nagako Hida; my goon goon, Tat Leung; and my popo, Tang Leung). Goon goon won. Goon goon would fish out quarters from the deep pockets of his brown slacks for me to dive after. If he didn't have any change that day, he’d pull out his keychain attached to his belt loop by a long thin chain, and remove the heaviest key and toss it in the water. We would spend hours at the pool--goon goon passed out in the shade in a lounge chair, me diving for his key, and my sister floating in the water. When our fingers were sufficiently pruned and our eyes burned from the chlorine, we’d return to 718. My sister and I showered. Goon goon threw the towels in the washer, while popo prepared the filling for Chinese dumplings. I always remember the afternoons being odd for some reason. I don’t have a clear recollection why, but I always remember it feeling empty and quiet. Maybe we were all tired from the heat. Or maybe we were all just ready for a nap. The TV turns on. Zach Morris and AC Slater are trying to outwit Mr. Belding and we begin to make dumpling wrappers by balling up the white dough. Center the ball of dough between the stainless steel plates of the press. Smash the dough into an oblong shape. Mess it up. Popo fixes it. We stuff the wrappers with the filling and run our moistened finger tips along the edge of the wrapper. Pinch, fold. Pinch, fold. Over and over until the filling is gone. Popo steams the dumplings in her awkwardly large silver steamer contraption on her stove. We stuff ourselves with dumplings, the white wrappers now turned translucent. Those are my memories growing up with my grandparents. Goon goon (left) and popo (right) during a family reunion in Honolulu to celebrate their 70th wedding anniversary. Born in 1919, my grandmother, Tang Leung, was 21 when she married her husband, Tat Leung when he was 23. A family photo that popo laminated and carried around in her wallet since Christmas of 1995 in Halifax, Canada. Some time after I left for college, a lot began to change at home. Popo and goon goon were getting older. Every time I returned home it seemed they aged a decade. The changes seemed so much more dramatic each time I parachuted in and out of Hawaii. As they slowed down they moved out of 718 and into an assisted living community. 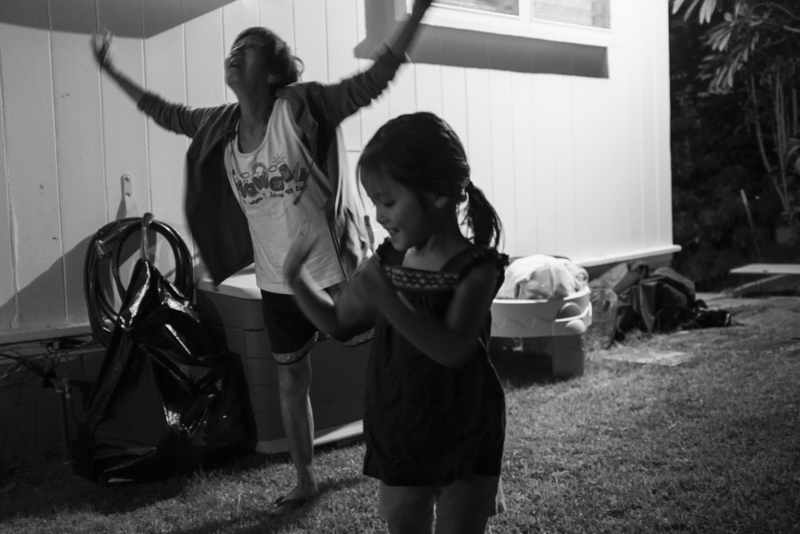 So much of the responsibilities fell on my mom’s shoulders as their only child in Hawaii. 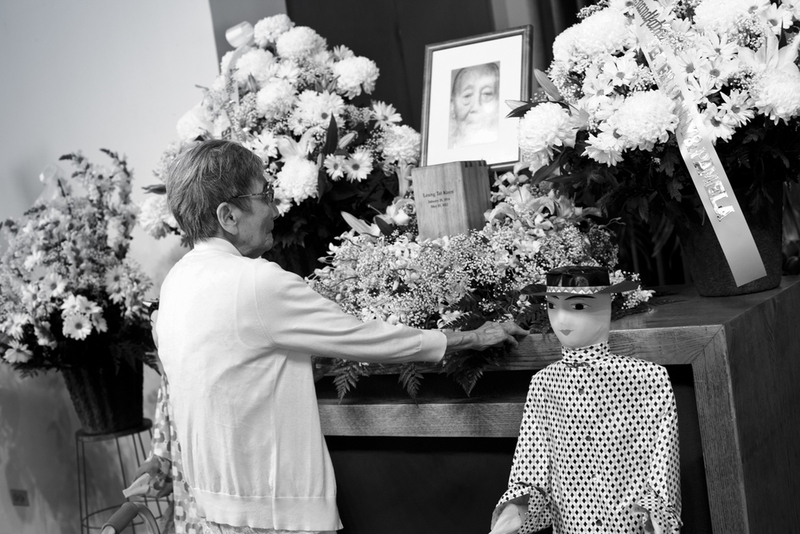 For over a decade my mom patiently and diligently tended to every demand by my grandparents as they tried to find their old lives in a new environment. Where would popo and goon goon be satisfied with the food? Which aide would popo allow to bathe her? How many times would popo need to fall before she realized she needed to use a walker to maneuver? When would she stop arguing about the kind of television my mom bought for her? The thing to understand is that popo is a strong woman to a fault. She’s determined and she’s strong-willed. Stubborn and argumentative. She knows what she wants and she won’t stop until she gets it. Unfortunately, that translates into a daily uphill battle for my mom, which became increasingly combative as my popo’s dementia progressed and her health condition deteriorated. Popo lost track of reality and time. She became increasingly incoherent. And every interaction turned into an argument. I can only imagine my mother never feeling appreciated by her own mom who she provided care for on a daily basis. It took a severe toll on my mom’s happiness and health. I feel guilty because I have not lived in Hawaii for 15 years now. I have not been around to support my mom during the most difficult of times with my grandparents, especially after goon goon passed away three years ago. So when my mom called last week with the news of popo’s prognosis, it was time to come home for her last few days. Goon goon passed away on May 25, 2012 in his sleep. Popo paid her respects at his memorial service during which we burned cardboard VCRs and TVs, effigies of servants, and a sports car to send him safely onto the afterlife. By the time I arrived Popo seemed frozen. She couldn’t speak. She could barely open her eyes. And she had stopped eating. Her body was shutting down as she neared the end. I told her all about my new life with Jenny in the bay area. I told her about a really awesome tripod I’d purchased recently. And I shared with her our memories. She lit up when we video chatted with my cousin and reached out to my niece when she came to visit. She shut her eyes in pain and sadness when Jenny and I had to leave for the day. I kissed her on the forehead and promised to return. On Saturday, October 3rd we received a call from Kahala Nui at 4 in the morning. Popo was not doing well. My mom, dad, uncle Peter, aunty Penny and I rushed down in the still of the night. My mom held her hand and told her everything was okay. 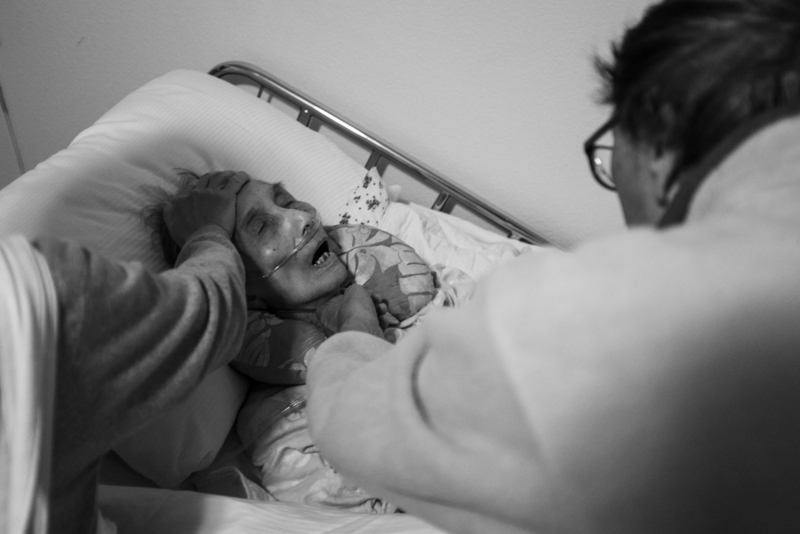 I watched popo’s chest rise and fall for the last time as she took her final breath and passed peacefully into a better place.